Love is in the summer air. 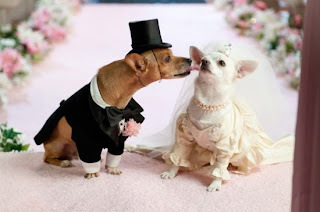 There is no better way for your favorite boy and girl puppies to express their eternal love for each other than with a wedding. 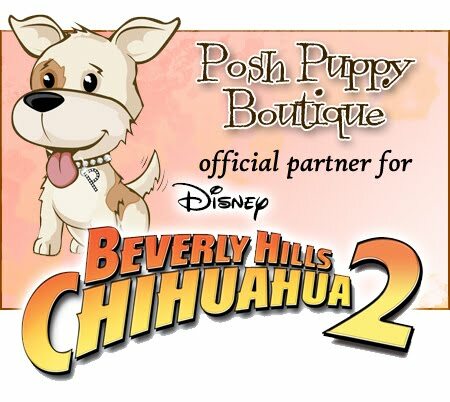 Let the Posh Puppy Boutique handle your dog wedding needs, just we did for “Beverly Hills Chihuahua 2” (we are an official Disney Partner). Dress the bride in any of our many wedding gowns, all of which show your excellent taste. They include the Crystal Cream Lace Gown ($1,610-$1,800) from Chien Coature ®, which is lavishly encrusted with Swarovski Elements Crystals and Pearls and lined in cream silk faille. The neck is closed with a 24 karat gold plated lobster claw with crystal and pearl dangles. This gown is available in sizes from extra, extra-small to large and dogs weights from 2-14 pounds. Nothing says style like silk and that is what The Wedding Dress ($725-$755) is made from: 100 percent silk. Each dress is custom made and available in sizes from double extra-small to double-medium. The Just Adorable Dress ($198-$228) is made of silk organza with embroidered flowers, tiny pearls and sequins. It includes a wrap-around ribbon tie for a perfect fit. Another perfect bridal option is our Wedding Gown with Veil and Leash ($90-$100), which is a white satin and lace outfit. It has three layers of delicate lace skirting. It comes with a matching veil with six layers of high quality Tulle. Topping the outfit is a matching white satin leash. Your groom will match his lady’s elegance when he walks down the aisle dressed in his tailored black tuxedo ($145) complete with white satin lapels and your choice of colored bow tie. Another option is to reverse the colors and go with a tailored ivory tuxedo and black bow tie ($145). The groomsmen will strut their stylish stuff dressed in this William Tux ($46-$50) made with black pinpoint Oxford, a white hankie, white collar and black bow tie. We also have elegant shirts for the ring bearer ($35-$41). Don’t forget the bridesmaid with this pink satin dress ($55) with veil, hat and leash (as seen on the Tyra Banks TV show). 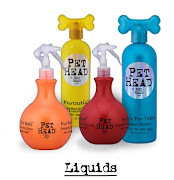 These and many other pet wedding outfits and accessories are available at the Posh Puppy Boutique or by calling 888-837-5230.